Tales of Whisky and Smuggling is a fun read, full of stories that take a variety of paths, but at heart are all about the struggle between what we might call the revenue men, though in the book they’re usually referred to as gaugers or excisemen, versus the smugglers, the home-distillers operating outside the tax scheme much as their foreparents did, making their Uisge Beatha (water of life, or whisky). Neat, right! Even neater though, is when reading one of the stories I learned of the deoch-an-dorus, or a drink-at-the-door you give a guest as they leave. That’s a great tradition. I am in to that! Check out the below quote to see it in action. ‘Ach,well, you’ll just have a deoch-an-dorus before you go, I insist,’ their host said. Although feeling vaguely disappointed Holton and Muir were delighted to have this traditional Gaelic drink-at-the-door. James fetched glassed and poured them a hearty measure each and a smaller one for himself. The gaugers tossed off their drinks and said goodbye to their very convivial host, who was delighted to see how unsteady they were on their feet as they set off down the road. I’ve talked a pretty fair amount about my love of the writer Chester Himes, and pretty much everything he’s written. And have had a number of quotes from books of his featuring the Harlem detectives Grave Digger Jones and Coffin Ed Johnson. But I’ve never had a quote from the book All Shot Up? That seems almost unbelievable. But I’m here to rectify that (and might have more quotes from this book in the future, cause it is awesome) with the below from the very first page of the book. His eyes popped. He knew he was sober. He hadn’t been drinking any whisky and he hadn’t been smoking any weed. But he didn’t believe what he saw. It was a mirage; but this was not the desert and he was not dying of thirst. In fact he was cold enough for his guts to freeze; and the only thing he wanted to drink was a hot rum and lemon. He saw a Cadillac pass, the likes of which he had never seen. And his business was cars. This Cadillac looked as though it were made of solid gold. As the temperature here in Seattle is coaxing its way down into downright chilly, I’ve been writing about switching into the darker, warming-er, drinks. 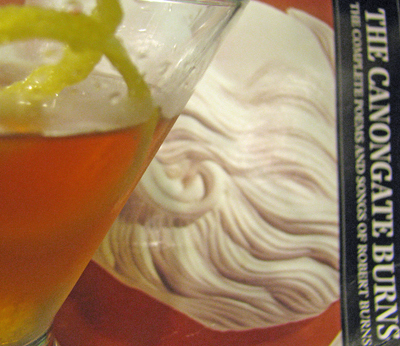 Or, I just wrote about one of my regular fall/winter drinks, the Bobby Burns, for the always-good-to-read Good Life Report. 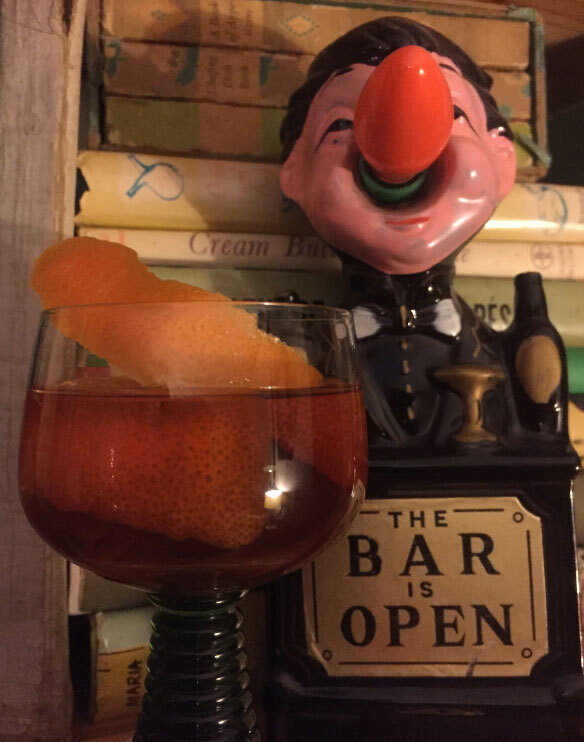 You, actually, should go read my article right now, and learn how to make this Scotch, sweet vermouth, Benedictine combo cocktail, and learn a bit more about the poet Robert Burns, and learn a stitch of a poem of his about whisky, a poem excerpt you might want to read when having the drink, and also learn about a cigar salesman. That sounds like a lot of learning, but really, it’s painless (and tasty). So get going, and go read my Fall Poetics and the Bobby Burns cocktail article. The following two quotes, the last of those from the Raymond Chandler book Pearls Are A Nuisance, which I talk about more in Take 1, below Take 2, which is below this post right here and now. These quotes are from the final story in the collection, “The King in Yellow” and include one about drinking light and one about drinking heavier. Not a bad way to end up, though I think Mr. Chandler would be more happy with the latter, were he still around to drink with (sadly, not the case). Steve said: ‘Coke with a dash of bitters,’ to the waiter. The maid came back with a copper ice bucket. 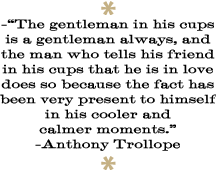 She pulled a low Indian-brass tray-table between them before the davenport, put the ice bucket on it, then a siphon, glasses, and spoons, and a triangular bottle that looked like good Scotch had come in it except that it was covered with silver filigree work and fitted with a stopper. Dolores Chiozza said: ‘Will you mix a drink? in a formal voice. He mixed two drinks, stirred them, handed her one. She sipped it, shook her head. ‘Too light,’ she said. He put more whisky in it and handed it back. She said, ‘Better,’ and leaned back against the corner of the davenport.